A pet sitter is an invaluable contact in a dog lover’s life. Not just anyone is qualified to care for your precious pooch. Your dog is a living being and looking after him or her is not anywhere near the same as looking after someone’s home or garden or plants while they are away. This is something we keep near the top of our minds at all times at Love on a Leash. 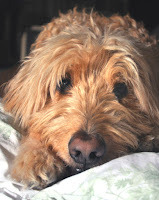 Your pets -- our clients! -- are precious. And as with many areas, not all dog-related services are on the market. We visited some, then put together some information on what to look for in a dog sitter and basic qualifications every pet sitter should have under their belt. Please keep pet sitting requirements in mind when you are making your vacation plans. The good pet services fill up fast! I highly recommend you book peak vacation times (Christmas, Spring Break, Easter, Long Weekends, etc.) as far in advance as possible to ensure your favorite sitter is available to care for your pooch! Before you go away on your next business trip or family vacation, remember to speak to your family vet and forward an “Absent Owner Consent” form or ensure you have filled out the one we keep on file at Love on a Leash. In the event of an emergency your wishes will be met and your pet will receive proper care administered immediately. • Ensure all your dog’s daily requirements will be met – food, water, medication, walks, kisses & hugs. • Inform your family vet you are away and who your pet sitter will be. • Discuss your pet’s current health concerns with your vet & your wishes regarding the care of your pet while you are away. • Make sure your pet-sitter has the following information: your contact information, vet contact details, pet emergency preferences, adequate supply of medications and full disclosure of your dog’s health history and concerns, plus financial information for emergencies. Remember that all pet sitters are not the same. Ask for references and credentials. Ideally your pet sitter should be licensed with the city they are working in, as well as bonded & insured. Your pet sitter should be certified in pet first aid and belong to a professional organization such as Pet Sitter’s International or the All Canadian Pet Sitters Network and your sitter should have a website posting information and rates in a professional and concise manner. As an accredited pet sitter, I can tell you that we take our job seriously and do everything in our power to ensure your dog’s stay with us is as comfortable, safe, fun and loving as possible for your dog. At Love on a Leash we truly adore our doggy clients and they love us right back! 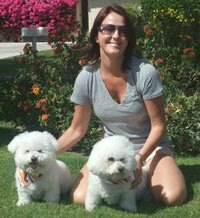 Love on a Leash’s Tammy Preast with Casey and Finnigan, her own dogs, both adopted. Don’t miss a single issue of PADs! Love on a Leash’s FREE monthly newsletter with helpful information about all things DOG in Vancouver and the GVRD! At Love on a Leash Trusted Dog Care, we treat your dog just as we would one of our own beloved canine companions. All dogs have daily play sessions with other dogs, if they are social, dogs go for walks several times a day, they laze around the house wherever they are comfortable and if your dog sleeps on the bed at home, they are welcome to sleep on the bed in our homes! We offer overnight dog care services in Vancouver, including Kitsilano, the West End, Downtown and The North Shore as well as throughout the Lower Mainland. We truly adore our dog clients! We do our best to love your dog like you love your dog. We love all dogs: their unique personalities, characteristics and challenges! Rest assured that while you are away your beloved dog is receiving plenty of TLC and will be happy and healthy when you arrive back home. Our rates are all inclusive: that means daily dog walks throughout Vancouver, loads of TLC, snuggling, affection and one-on-one time... and no hidden charges. At Love on a Leash our reputation for reliable, responsible, loving in-home dog care in Vancouver is second to none and we aim to keep it that way. We like to say that a stay at Love on a Leash is like summer camp for dogs -- 365 days a year! The Best List of Dog Parks in B.C. Why Do Dogs Eat Poop & Grass and Other Nasty Stuff? Pumpkin: Superfood for your Pooch!